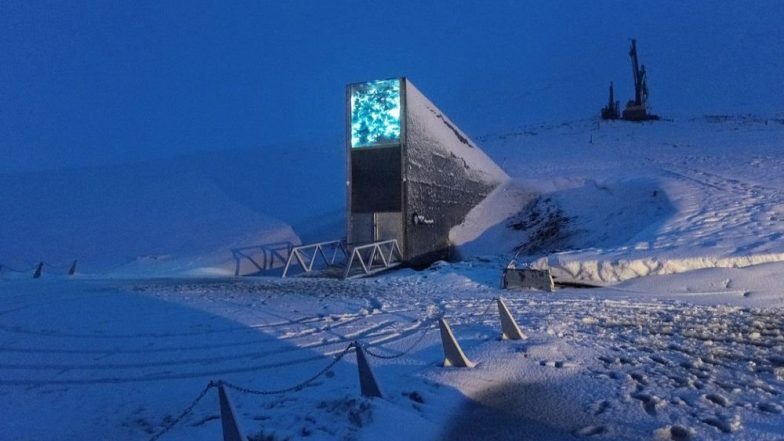 Svalbard Global Seed vault, the site in the North Pole that was made to save genetically engineered seeds from nuclear war and other calamities, might be already damaged due to the effects of climate change. It is the world's northernmost settlement that contains specimens of the world's most seeds. While it was made to save the species that may be forever lost, the location has itself become the fastest warming location on Earth. Scientists Prepare for Doomsday by Building Noah’s Ark Style Vault for Good Germs That May Save Humanity. The global seed vault which is known as Doomsday vault is located 1,300 kms from the North Pole on the Norwegian island of Spitsbergen near Longyearbyen in the remote Arctic Svalbard archipelago. The vault located amidst heaps of ice is said to be indestructible, serving as natural cooling for the genetic material. It is under potential threat from avalanches, floods and warming. The spot is increasingly warming than other places on Earth. Crop Trust executive director Marie Haga, "Svalbard is the ultimate failsafe for biodiversity of crops. The rising temperatures have partially melted the permafrost leading to flooding in the region where the tunnel is built." Global Warming Effects: Coffee, Beer, Chicken Tikka and Other Food Items We Will Lose to Climate Change. Ellen Hambro, director of the Norwegian Environment Agency, in a statement about the report in February, said, "It is rare that I use words like this, but what is happening in Svalbard is extreme. The temperature is rising faster here in the Arctic than anywhere else in the world, and climate change has already had major consequences for nature, animals and the community on the island group." In a century, the average temperature in the town will be increased further by 8.3 degrees. The seeds' preservation depends on stable and dry temperatures, but the conditions have changed. When the vault opened in 2008, the place was said to be the safest place on Earth to store seeds. After its opening, more than a million seeds of 6,500 species have been added to the vault.